“Until I started Snuggle Blankies in July 2007, I taught dance and drama at local schools and other venues for music and movement. I enjoyed my job but as time went on I began to want to spend more time at home with children George 10, Freddie, five, and Millie, three. Millie has cystic fibrosis and I wanted to be able to be at home with her more to give her the care she needs. “The idea for the business came about really at Christmas, 2005. I decided to have a go at making handmade fleece blankets for family as presents and then, following that, throughout the year, I made some pram/buggy blankets for my friends’ babies etc. This then led to people asking me to make blankets for them. “In the summer of that year, I was then approached by a good friend Shareen Hannan of The Little Peeps Gift Company to make pram/buggy blankets for her new business venture. These were to go into her baby gift boxes. “Together, all of these things proved a great success and gave me the encouragement I needed to start a business of my own. So I chose the name Snuggle Blankies, searched the Internet for suppliers of fleece and thread, a friend designed my logo and I had the website made. “Today I sell handmade fleece blankets made to order. 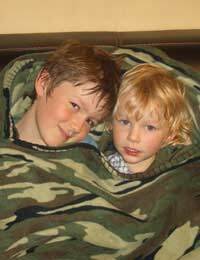 You can choose the colour of fleece and motif of your choice and the blanket can also be personalised. “The main benefits of running the business are that I am able to earn a little extra money and to look after the children, especially Millie. It can be stressful at times, however. Things can run quite smoothly if my orders are spread out but at Christmas, for example, I was very busy with blankets, had poorly children and was unwell myself. The blankets seemed never ending – and I couldn’t just ring in sick! “But overall, it has worked out well for me. I didn’t ever have big plans for it or ever expect to become rich from blanket making. It’s just a sweet little business - that is sometimes more like a hobby and that fits in well with life at home. “In the future, as the children get older, I will probably develop Snuggle Blankies alongside a part-time job. I love making blankets but there is no real money to be made because of the time it takes to make one - unless I triple my prices!